Autumn is the perfect time to start planning the outdoor kitchen of your dreams. The process will take a few months so make the most of winter approaching to design, organize and coordinate a spring installation. While you are considering all the options, here are a few must have for the outdoor kitchen that will dazzle your friends and making entertaining a pleasure. From the cooking you do in your kitchen inside you know that flow and efficiency are very important. You’ll want to handle cooking chores easily and be able to socialize with guests. Consider the amenities you will include (grill, smoker, sink, mini-fridge, etc.) and design the layout to maximize efficiency and minimize steps. Remember to include counter space. You don’t want to be that guy you see at barbecues who is standing at the grill, trying to balance a tray of food while flipping burgers. Plan a work zone that allows for some prep and holding space. You will need some cabinet space to hold equipment and food prep basics and you will want them to be able to withstand inclement weather. New choices come on the market everyday but there are several reliable options. Stainless steel is virtually indestructible and will give your space the look of a professional chef. For a more rustic look you could choose brick or stucco to encase traditional cabinetry. This style would look terrific with a terracotta tile countertop. Also popular for their durability are powder coated metal cabinets. The bonus to this style is the many color choices. Whatever material you choose, think about including drawers in the cabinet framework. This element offers convenient storage for utensils and cooking spices. Grills come with all the bells and whistles these days, but before you blow the budget consider the type of cooking you will be doing. Along with a customary grill top you can choose options like a smoker, a rotisserie, warming racks, side burners and griddle (weekend breakfast pancakes!). If you’re a regular burger and steak family, go basic. If your entertaining is a more adventurous, consider what upgrades will be important for you. If your entertaining includes adult beverages, a bar is a definite must have. This is another reason to plan appropriate counter space. You can easily design a bar by including a countertop overhang so guests can pull a stool up and chat while you play bartender. Think about how you will store the beverages. If your guests are mostly wine drinkers, then a wine cooler would be beneficial. If mixed drinks are your refreshment of choice, then a liquor well or lockable storage cabinet will come in handy. A small fridge for chilled beverages will save considerable time since you won’t need to be running into the house or – heaven forbid – digging into that ugly Igloo cooler for a cold brew. If a refrigerator doesn’t fit into the budget, then consider a cold beverage bin. It can be built in for a polished look and will hold enough beverages for a friendly cook out. That beat up patio umbrella isn’t going to do much to enhance your new outdoor kitchen. While an open air structure may seem like an extravagance, think of it more as protecting your investment. A roof top will prolong the life of your grill, counters, cabinets and other equipment by offering protection from rain and hot sun. You will be putting a lot of time into cooking fine meals so your planning should extend to considering where you will sit to enjoy them. The outdoor kitchen should be one cohesive space. A table that comfortably seats your family is the first step. Then think about how you will extend seating options for entertaining. Maybe a bar railing around the patio or small end tables where guests can rest their drinks and plates. After dining, seating for relaxing is also a must have. You’re going to be grilling up a storm so you will need a place to kick off your shoes and rest on your laurels. Everyone thinks about cooking outside in the summer, but entertaining during three seasons extends the use of your outdoor kitchen. Fire pits are all the rage and they bring a lovely warmth and ambiance to your outdoor space. Sitting around a warm glow chatting with friends is a way to build memories. For more functional warmth, you can consider adding small heaters to a roof structure or heat stacks to corners of the patio. Taking the chill out of the air is an inviting prospect. Are your creative juices flowing? 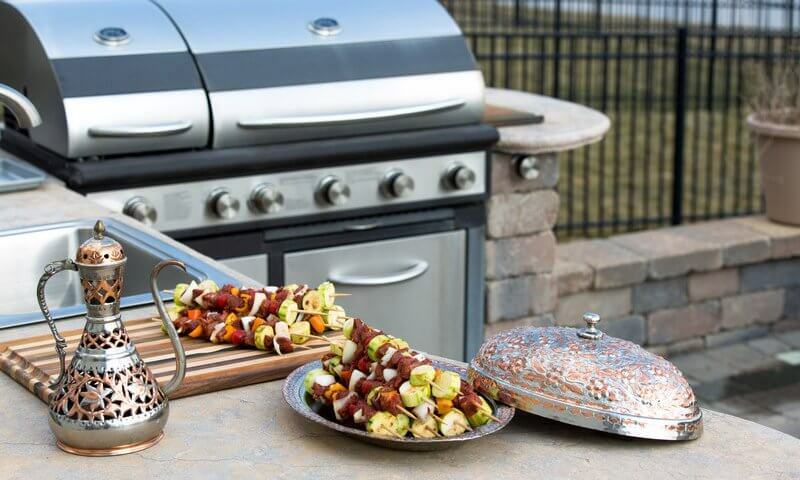 There are so many exciting options and such important must haves to consider that you can look forward to dreaming and planning for all the great moments your outdoor kitchen will bring. Enjoy!